First and foremost the sport of dog shows must be fun – Serious fun, but fun. The main objective for showing a dog is to attain the required 15 championship points. Once championship status has been attained, you may continue to show your dog to rank him/her in breed and group standings. A dog show is set up by local AKC sanctioned clubs to promote breeding stock according to each breed’s standard. AKC has a list of every national club’s official breed standards. All breed shows—offered competition for all breeds and varieties recognized by AKC. Specialty shows—offered for only one specific breed or variety. For example, The Beagle Club of America has its specialty show only for beagles. Group shows—offered only for the breeds in one specific group. For example, The Potomac Hound Group only features dogs in the hound group. how can I be informed of upcomming dog show? Contact your breeder, get on the show superintendents mailing lists or contact AKC website. This is the organization that sets up the show, sends out premium lists, accepts entries, calculates breed entry numbers and sends out schedules. They maintain results and forward all info to AKC. What is a Premium List? What are the requierements t enter an AKC dod show? Dog must meet the eligibility requirements in the official breed standard. Spayed or neutered dogs are not eligible to compete in regular classes. What is y responsability before I enter my dog? What equipment do I need to go to the dog show? Enough water and water bowl or bucket. Crate, this is very important to keep your dog relaxed. For the outdoor shows you will need a canopy for shade. What time do I need to be at the dog show? What d I need to wear and why? For men, a jacket and tie with nice slacks and sport shoes but never tennis shoes. For women either a nice dress or skirt with a jacket and pantyhose for a finishing touch. Always dress like a lady. Be clean, neat and professional. Remember you are just as much a part of the picture as the dog is. This is the only sport where the amateur competes against professionals. You must perfect the art of showing your dog, have the confidence to compete and dress to complete the picture. You must have pockets in your jacket or for women in your dress or skirt to have easy access to your bait. What is the role of the judge? What is the role of the handler? Present the dog showing his best attributes and hide his faults. In order to do this he needs to stack, move and present the dog in the way that best resembles the breed standard. The handler must be on time and present his dog without wasting the judges time. What is the roll f the ring steward? What is my responsabilty in the ring? First and foremost BE ON TIME! Pick up and wear the correct armband. If possible watch class(es) ahead of yours to see how the judge is running his/her ring, you only have one chance to make a first impression. Be proud and confident of your dog and know how you are going to present him/her. Whether you win or not, say “thank you” to the judge. If you don’t win, remember to always congratulate the winner. If you win a second place ribbon, stay close by (at ringside) in case you must go in for Reserve Winners. What is my responsability in the ring? Keep him/her safe; provide him/her with a proper sized crate, one dog per crate. Make sure he/she has water available, with a coated dog you may not want to leave a water bucket in his/her crate before he/she shows. Keep him/her cool and relaxed. He/She must give you his/her best before showing. No unnecessary stress. What is my respnsability at the show site? Follow rules set up in premium list. Leave your set up area as clean as you found it. Be courteous to other participants (handlers and dogs). What is the judge s responsability? A judge must meet AKC’s qualifications. Judges must know your breed standard and you are getting his or her interpretation of that standard. Always treat them with respect. Judges should evaluate every competitor equally with regard to examination and movement. It is the Judge’s responsibility to pick that dog that best fits is his or her interpretation of your breed standard. Remember there are good judges and bad ones. Judges must be in control of their ring and present him or herself in a professional manner. The judge must communicate effectively with the ring steward, whose job it is to call in dogs for the correct classes, have the correct ribbons and trophies available and to verify armband numbers to the judge to be properly recorded. First and foremost, it is a commitment and investment that you make to promote and exhibit a dog of your choice. You must make the decision on how much time, energy and money you are going to devote to this sport. This is the only sport in the world where the amateur competes against the professional in the same ring. You must understand that most professionals have multiple advantages over most new handlers just because of experience. At Dog Community we want you to be able put the total picture together before you start showing so you won’t waste your money and get discouraged. DON’T SET YOURSELF UP FOR A LOSS. You must know your dog and the breed standard. You must know how to properly groom and condition your dog. You must know and have the confidence to present that dog so that he or she puts their best paw forward. You must present yourself as if it is a special occasion for you and you are proud to be there. Understand that you are asking a particular judge for his or her opinion and it is strictly his or her opinion on that particular day. There are good judges and bad judges and we learn by experience not to enter under the bad ones. Just remember it is “His or Her” opinion on that particular day. It is always fun to win, but losing builds character. Learn to evaluate what your judge is looking for in your breed. If you can figure it out keep it in a file and show that aspect to him the next time. If it is helter skelter judging, don’t waste your money next time. Know why you won and why you lost. There is nothing like winning your first point!! Just remember you can’t win them all. Whether you win or lose ask yourself what you can do better next time. Again the most important part is controlling the head. Place your collar up behind the dogs ears, pull all loose skin away from collar, hide the collar if necessary with comb or brush, then roll your leash into your hand until invisible. 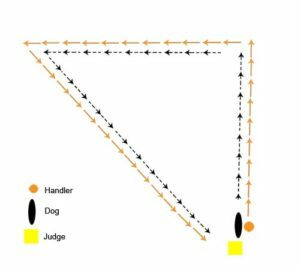 Pick a target in s straight line away from the judge and move so your dog runs parallel to you. As you make your turn to come back to the judge always make sure you are inline with the judge so the judge can see front movement. The purpose of this exercise is to show the judge rear and front movement of your dog. When you possible watch the pattern that the judge is using, so you can be ready. Always adjust your collar on your dog when moving away from the judge, pick a target to help you move in a straight line as you can turn left pick another target. You may stop and circle to your right or slow down and turn the corner. Make sure you align your dog with the judge. Do not run into the judge; give yourself 10 ft to plan your stop. Know your best aspect of your dog and present them to the judge on your return. The purpose of this exercise is to show the judge rear, side and front movement of your dog. When you possible watch the pattern that the judge is using, so you can be ready. Always adjust your collar on your dog when moving away from the judge, pick a target to help you move in a straight line as you can turn left pick another target. You may stop and circle to your right or slow down and turn the corner. Make sure you align your dog with the judge. Do not run into the judge, give yourself 10 ft to plan your stop. Know your best aspect of your dog and present them to the judge on your return. The purpose of this exercise is to show the judge side movement of your dog. To see the circle video click here.